Brief Synopsis – The Banks family must now deal with impending parenthood and grandparenthood in this sequel. My Take on it – This is a psuedo remake of Father’s Little Dividend (1951) and as with the first movie in this revamped series, they were smart to reimagine the storyline as a comedy. 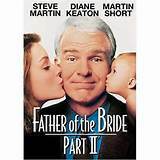 Steve Martin and Diane Keaton are both great once again and bring much needed humor to this movie’s story. The movie starts off well but goes into numerous outrageous plot contrivances that lose their funnyness way too quickly. It was nice to visit the Banks fsmily again, but I wish it would have been a more fun time. Bottom Line – Works much better than Father’s Little Dividend (1951), but still not as good as the first movie in this remake series due to some really outrageous plot contrivances. I saw this in the theater the weekend it came out. I remember that it wasn’t as good as I expected. If I remember right, I think they used Martin Short’s character a little too much. I love Martin Short, but a little would have gone a long way with that character.